The cool room is the heart of any great commercial kitchen, bar or function centre. Sure they look simply like a giant esky, but if they aren’t installed correctly, they can easily become the biggest lemon in your business. In an alarming world where “Cheap” is so often being selected over “quality” we are seeing firsthand, the regrets from clients who have not understood the true meaning of value for money. A well-built cool room will offer you years of service. When designed and assembled correctly it will provide a safer work environment, last longer and can even be worth more as a point of resale down the track. Remember, the less your equipment runs the more money it saves you. When the engineering of the plant and the build quality if the room is “spot on” you maximise the life expectancy of the package and further reduce your capital equipment budgets for the future. So it is important when pricing your next cool room project that you know what you are about to purchase. Please take a moment to read the following inclusions so that you can see the added value that we offer as standard items. Many of our competitor’s cut costs when selling a room and disregard several of our standard items. Surprisingly quickly one can discover that what seemed like a cheap start-up cost at the time, ends up costing more in the long run with expensive operational costs. A classic example is one client who purchased a “build it yourself kit” through the internet. They built it themselves saving a little money. What they didn’t count on was the amount of door handles and hinges that would fail. Our tests on this room found that a person could have bene locked in the room without a way to get out when the handle failed. We also noted some ordinary construction alignments which will result in failure of the vapour barrier. We know in a few years these panels will be water logged and at any point of resale, the room will be requiring an upgrade again. 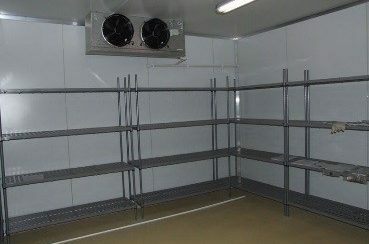 We have found some of the imported refrigeration systems are often non-compliant with Australian Standard wiring rules. Imagine if a fire occurred and your insurance was declined based on these types of findings? Here’s 20 reasons why you should buy through Allen Air & Refrigeration. The wall and ceiling panels are made of lightweight insulated panel from a range of thicknesses dependant on your needs, with internal and external skins of Colorbond® steel, laminated to a core of expanded polystyrene (EPS) insulation. Generally the colour is white and the panels come in a standard width of 1200mm with flat or ribbed surface finish. Therefor it is an economical advantage to use full or half sheets when designing the room size, so it pays to keep this in mind when planning your store layout. It is a council requirement to apply infill panels between the ceiling and the top of the cool room to prevent vermin and accumulated dirt from existing. Therefore, where required infill panels will be installed above rooms to the finished ceiling level and are normally made of melamine but can be made of full cool room panel. Hinged and sliding doors are made of heavy duty construction and are of the same material and colour as the walls and ceilings. The edging is made of aluminium extrusion providing a rolled edge and assembled using 5/32 rivets. This protects the door against fractures that are common with plastic and fibreglass edged doors and so will last much longer. The gasket material is housed in a plastic extrusion channel designed to limit cold bridging and allows for easy cleaning of the gasket surface. Unless otherwise specified, freezer doors are of equal thickness to the wall panel thickness, whilst cheaper rooms from our competitors can have undersized doors. 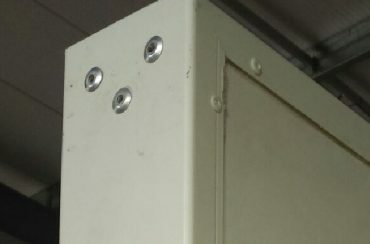 Hinged doors – are fixed through the panel wall with the “Thermal hinged beam” using 5/16” hinge pins or similar method. 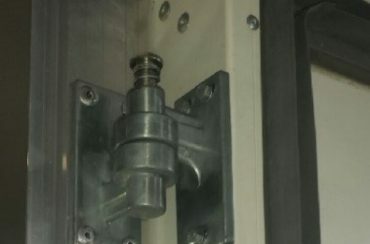 This is far superior to rising hinges screwed directly into timber backing behind the “plug”, “frame” or “door surround”. 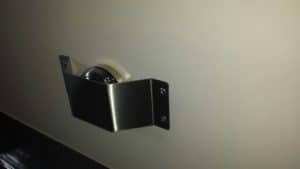 A Kason side mount magnetic door catch secures the door to the frame with a lockable mechanism. This catch is removable from inside the room without the need for tools for peace of mind. Sliding doors – are supported via heavy duty aluminium double J track with adjustable mounted guides to secure door to the door frame and ensure optimum seal of the gasket. 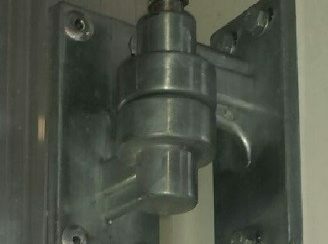 A bump rail style handle is mounted at the opening end of the door and protects the “locked inside” alarm bell from damage. Unless otherwise specified, sliding doors do not have a locking mechanism. Door frames are made of plastic extrusion to house heater cables when required, offering an improved “thermal break” and are externally protected by rolled edge aluminium extrusion as used on the door surround also. Door frames can never be less than 600mm wide and 1500mm high. As per Australian standards requirements, All doors will have an audible “locked inside” alarm bell. Hinged doors use standard R187 rubber gasket which offers a clean surface limiting bacteria growth. Sliding doors have two finger silicone gaskets which are easy to clean and offer a good thermal break. 35mm radius coving is used on all “floor to wall” and “vertical corner” joints. 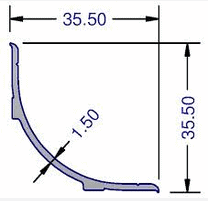 40mm angle is used at all “wall to ceiling” joints. 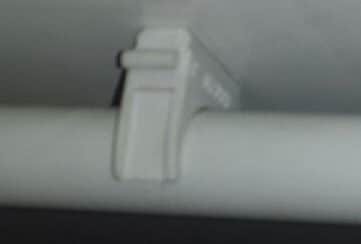 Coving and angles are secured using 1/8th pop rivets at approximately 400mm centres. Unless otherwise specified, external coving at the floor joint will only be installed in kitchen areas where vinyl flooring is not being used. If a cool room or Freezer is not sealed at all external joints or openings, the panel draws moisture into the polystyrene and eventually becomes water logged. Any room witnessed as “sweating” on the outside is an example of this. We see this important step is missed when people install “packaged” or “flat packed” rooms from overseas. It takes masses of energy to cool down a water-logged room. All external joints and trims are fully sealed using non-drying mastic allowing for expansion to ensure the “vapour seal”. Internal floor, wall joints, trims and fittings are fully silicone sealed for hygiene. The roof will remain unsealed on the inside to assist in expansion control and panel dehydration. An electronic temperature controller with easy to read display will be mounted in a suitable location determined on site. The controllers have inbuilt defrost capabilities as standard even in the case of cool room applications. This allows the user to force a defrost for those odd occasions where it is needed. Cool rooms and freezers will have one sensor located adjacent to the piping entry into the cool room. Freezers also have a second sensor located within the fan coil unit at the best location determined by the contractor, which is designed to reduce unnecessary lengthy defrosts saving energy costs and improving stock quality. 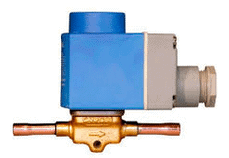 An included safety design function is for the temperature controller to operate a solenoid valve which closes when the compressor is not running. This method of control ensures the compressor does not “slug liquid” which is the reason for many failures on some competitor’s products. A dedicated electrical circuit complete with isolator switch adjacent to each condensing unit will be installed by our qualified electrician. We include all control wiring and lighting circuits to the room. 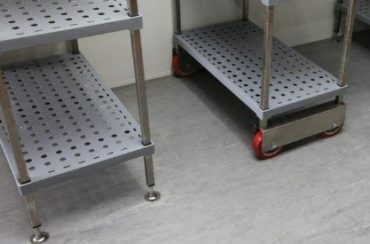 All conduits are mounted on stand-off blocks to allow for cleaning behind, therefore meeting requirements for hygiene. Drains have p traps installed to keep vermin and moisture laden air out of the room and are run to a tun dish or other plumbing provided by the client. 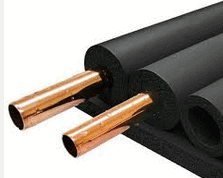 Drains can be upgraded to copper for high spec operations. Evaporators (Inside the room) are of the highest quality and where necessary will have coil treatment to help prevent corrosion. Serviceable drain trays can be removed if necessary for cleaning. 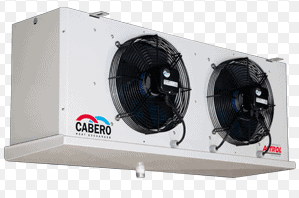 Condensing units (outside the room) can be either be of standard open style construction with weather covers if required, or, a packaged condensing unit type. 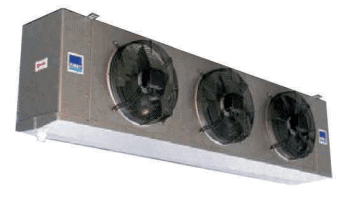 The condensing units include all the required pressure controls, oil separators and other associated equipment as required to provide a complete and reliable system. (Beware of cheap units that do not come with the important devices that we include as standard) These units must be installed with adequate ventilation and generally should not be installed in the ceiling space, so this should also be considered in planning your project. 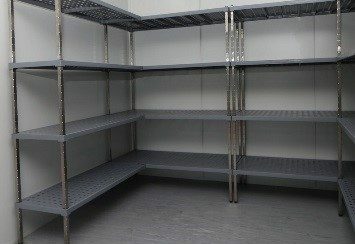 We can provide you new cool room and / or freezer with appropriately sized shelving area to maximise the storage space. We recommend and use Mantova and other products that offer easily removable shelves to allow for cleaning. Manufacturer’s equipment carries a 12-month warranty on equipment failure. Allen Air and Refrigeration offer 24hr 7 day service and will warrant the installation against defects for a period of 12 months from the date of commissioning. 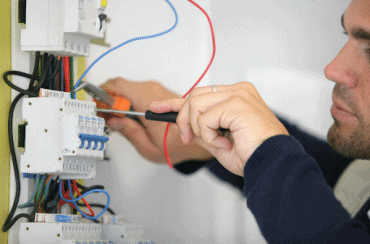 Our team of qualified tradesmen are well trained and will serve you and your equipment to ensure it is running efficiently and reliably for the duration of its life cycle. Talk to us about continued maintenance plans.